Rwanda's largest freshwater lake, Kivu is a hive of activity for the local people, although the ports are not as busy as in colonial times. There are gorgeous views and scenery and it's a great place to relax during your sightseeing in Rwanda. The lake with is many islands and surrounding hilly bays covers 7000m2. 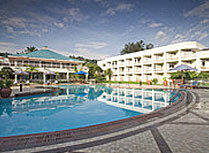 It lies in the heart of the Albertine Rift Valley and covers most of Rwanda's western border with DR Congo. It is the sixth largest lake in Africa and is 89 km long by 48 km wide. It is 480m deep at the deepest point, making it the 15th deepest in the world. Lake Kivu, due to it's location on a volcanic fault, is actually a methane lake, so there is no wildlife in it, apart from a few small fish species in the bays and near the shore. Gas is extracted from the lake bed and provides about 4% of Rwanda's energy at present. The border with the Congo is down the middle of the water and the Rwandan army regularly patrol the waters to ensure there is no cross border traffic! Just an hours drive from the gorilla tracking base of Ruhengeri by road, Gisenyi is the most northerly port on the lake and an interesting small town. It is split into the upper and lower town, the first being a set of busy rounds around a central market and the latter more spaced out with collections of banks, old colonial houses and hotels. Several hotels and guest houses border the lake shore. The waterfront with the sandy beaches are a lovely mix of palm lined roads and old architectural styles. With looks similar to a West African backwater town, it is not as humid as it sits at 1500m altitude making it a comfortable climate. There are interesting birds along the lake shore and a short walk away Rubona port has great views and you can explore in a dugout canoe traditional style if you prefer. Near Gisenyi is also the home of the Rosalind Carr orphanage which was started in 1994 to shelter orphans of the genocide, which is a fantastic project and one which has a great success story. To the south of Lake Kivu is Kibuye, another sleepy town which was the site of several terrible incidents in the genocide but is now coming back to live with some lively street front cafes and a good business infrastructure. 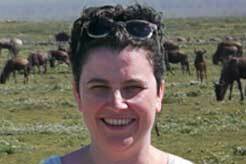 There are a couple of lake shore lodges here and an hours drive away is the hiking trail for the Source of the Nile. There is a view point near Kibuye where you can see the meeting points of the Nile and Congo Basins. 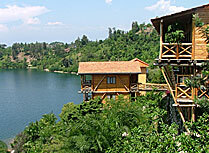 Rustic log cabins with lovely views on Lake Kivu, near Kibuye. Lake Kivu Serena Hotel is a stylish hotel set on the lakeshore where you can enjoy the excellent hotel facilities and accommodation. Various airlines fly to Kigali including Kenya Airways via Nairobi. Entry visas are issued on arrival, entry fee is $30, to British passport holders. 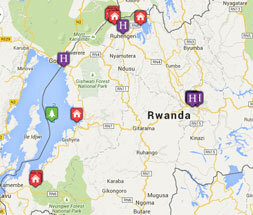 Rwanda is a malarial country but the risk is low as most of the country is at high altitude. The following vaccinations are recommended: Hepatitis A & B, Polio, Tetanus & Typhoid. Yellow fever vaccinations is compulsory. Seek advise from your GP.